A European satellite has beamed home its first map of theentire sky as seen in microwave light, to the delight of astronomers hoping tocatch a glimpse at the earliest days of the universe. 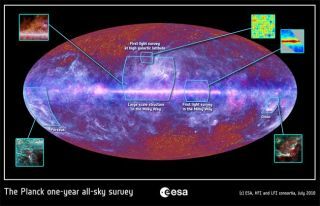 The new sky map from the Planck observatory is themost detailed microwave map of the sky and is a record of the oldest light inthe universe, so it could have important ramifications for cosmology ?including insights into the formationof the universe 13.7 billion years ago. Scientists have eagerly awaited the data from Planck sincethe mission was launched by the European Space Agency (ESA) in May 2009. The observatoryhas been meticulously scanning the heavens in microwave light, which has longerwavelengths (shorter frequencies) than visible light. Planck's microwave sky map shows the main disk of the MilkyWay where new stars shine brightly and streamers of cold dust reach above andbelow this belt. The map also reveals light echoes ? called the cosmicmicrowave background radiation ? left over from the BigBang thought to have created our universe. It can be seen in the mottledbackdrop at the top and bottom of the image. To get a full picture of this microwave background,researchers must digitally remove the Milky Way's light from the foreground toreveal the dimmer background radiation. Planck's observations are the most precise view of the cosmicmicrowave background ever obtained. These data offer hope of settling some ofthe most vexing questions in cosmology, such as what happened immediately afterthe universe was formed, and whether we are stuck in a cycle between BigBangs and Big Crunches due to repeat on loop. "This is the moment that Planck was conceivedfor," said David Southwood, ESA director of science and robotic exploration,in a statement. "We?re not giving the answer. We are opening the door toan Eldorado where scientists can seek the nuggets that will lead to deeperunderstanding of how our universe came to be and how it works now. The imageitself and its remarkable quality is a tribute to the engineers who built andhave operated Planck. Now the scientific harvest must begin." One of the main quandaries scientists hope to tackle usingPlanck is whether the Big Bang was followed by a period of rapid expansioncalled inflation. Such an expansion would have doubled the size of the universemany times over during a period of time much, much shorter than one second. The Plancksatellite is slated to continue scanning the universe until 2012, buildingup an ever-more-detailed map of the sky. "This image is just a glimpse of what Planck willultimately see," said Jan Tauber, ESA?s Planck project scientist.